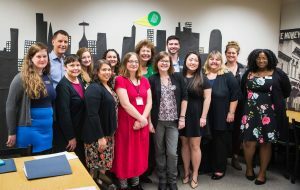 In an unprecedented visit, the Chief Executive Officer of the Big Brothers Big Sisters of America (BBBS), Pam Iorio, visited the BBBS of Southwest Washington Olympia office during her West Coast tour. The local team gathered with Iorio to showcase BBBS programs throughout Thurston, Mason, Lewis, Grays Harbor and Pacific County. 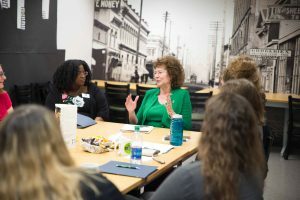 The meeting served as a review of past, current and future BBBS projects that connect children in traditionally underserved communities with an adult mentor. In addition to the updates on traditional “Big” and “Little” matches and in-school programs, the staff also introduced Iorio to special grants and local BBBS mentorship opportunities. Jill Kawulok, chief operating officer for BBBS of Southwest Washington, spoke of a recently completed grant project that involved mentoring in juvenile detention centers. Juveniles in the program learned soft skills for workforce development and continued to receive support upon release. 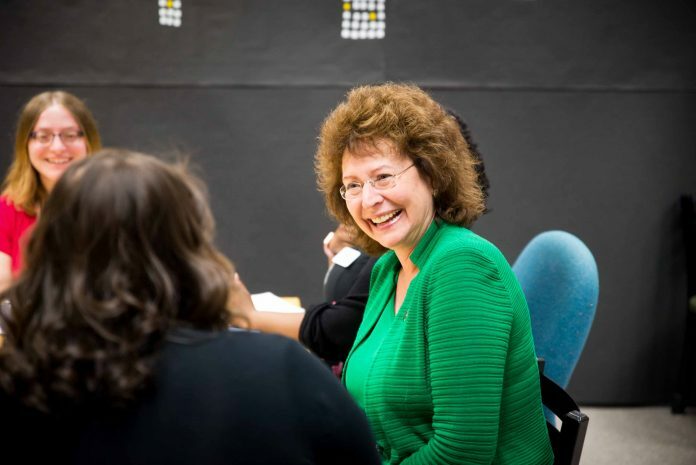 Special Programs Manager, Susan Kirn, worked on GIRL POWER!, a program that taught life skills, money management and career development to school-age girls, while matching the participants with adult mentors in their desired career field. Program Manager, Robyn Handley, developed a Science, Technology, Engineering, Art and Math (STEAM) program for her Littles in Pacific County. Iorio was impressed with the creation of additional educational opportunities for children within these BBBS programs. What served as the meeting room in the new BBBS Olympia office is the future site of the STEAM learning lab. The lab is a proposed gathering place for not only Big and Little matches but for other community members to meet after school and explore a plethora of educational topics. The lab will be complete with computers, a 3D printer and other STEAM activities. Iorio started her career in public office, including by serving as the mayor of Tampa, Florida, before being named CEO of BBBS of America in March of 2014. Throughout the meeting, Iorio shared her career history and wisdom with the Southwest Washington staff. She lauded the staff for the multitude of programs offered to children and mentors in the region. She emphasized the importance of youth education, especially in literacy, in addition to a consistent adult figure being a key for childhood resiliency. To learn more about the programs they offer, visit the Big Brothers Big Sisters of Southwest Washington website.